So to round off the week I found something ominous under the bed. Like a lot of things in our life, the bed is a bit improvised. It started life as a futon from Habitat (remember Habitat) – very smart, low with elm slats and two red futon mattresses. During the day it was a sofa with a low back – one mattress folded in half formed the seat, and one rolled up made the back. Two other base sections became coffee tables on either side of the sofa. Very sophisticated in its day, I can tell you. At night the coffee tables came to the front to complete the base of the bed and and the mattresses were piled one on top of the other. Few years back our double bed died, the futon went upstairs and became a bed-base, we bought a smart mattress plus a new sofa for the living room. The improvised bed is very comfortable but it has two drawbacks. The gap between the rail of the base and the floor is about a couple of inches which is plenty of space for the dust to get under but too narrow to insert the vacuum cleaner brush + the smart mattress is VERY heavy. Not that I mind dirt you can’t see too much. One of my flipflops went missing so I ended up on my belly on the bedroom floor with a torch between my teeth trying to see through the two-inch gap. Didn’t see any flipflops but I saw the dust of years and lurking someway underneath an unidentifiable white furry round object, size of a small orange. We’ve had two lots of dry rot and this looked just like a puff ball or even the beginnings of a wasps nest – certainly something organic. Nothing to be done about it that night; we were just going out with friends. So Sue had a restless night dreaming about things growing up through the mattress and I lay awake like a lion tamer planning my strategy for dealing with the beast. The plan was to remove the bed and then, because I thought it might burst into thousands of individual spores, place a clear bowl over the top, slide my dough scraper underneath, get it outside and hoover up any remains as fast as possible. Come the morning, strip the bed and haul off the mattress. Roll up the futon mattresses one at a time and remove them to a place of safety. The growth is under the front end of the bed so carefully lift out the two coffee tables to expose it. Peer at it intently. 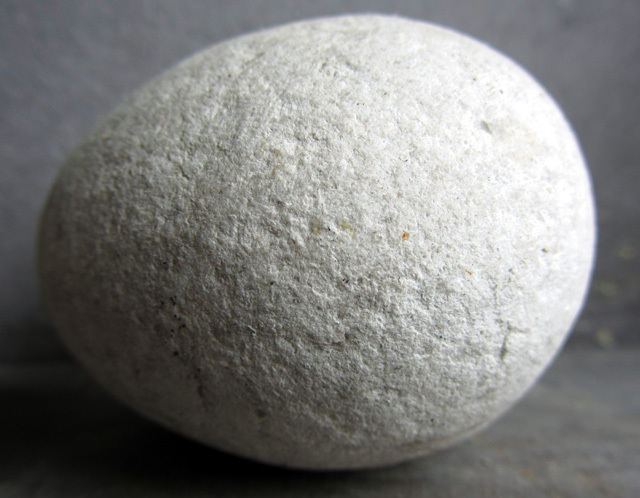 It is a white, rounded stone from Penmon Beach.